People sometimes ask me why I gave up performing. And until now, I always said that I didn’t fully understand it. I knew I had dreamed of becoming a great pianist since I was five years old, and that I had followed that dream as far as it took me, into a rewarding performing career. And I knew that when I discovered a new physical approach to the piano that instantly improved my students’ playing, I switched my main career focus to teaching. I remember how my students’ faces lit up every day that week, as they suddenly heard themselves playing more beautifully. And I remember the moment at one of those lessons when I saw light bulbs flashing in my head and realized I had something really important to teach. The next thing I knew, I was canceling a concert I had scheduled in Chicago, I stopped pursuing concert dates altogether, and I was giving a lot of talks to musicians called The Art of Practicing. All of this made a lot of sense to me. But recently, I decided to look back into my childhood to see if I could find any indication that teaching would eventually become my true calling. And I remembered that when I was 13, a magazine arrived at our house, in our sheltered, little, white suburb in California, and that the cover story of the magazine opened up a whole world for me that I had never heard of. It was LIFE magazine – a wonderful, weekly publication that unfortunately no longer exists. On its cover was the sweet, smiling face of a 12-year-old boy named Flavio who lived in a shack with his parents and seven siblings in dire poverty in the slums of Rio de Janeiro. Through the efforts of this journalist, money had been raised to bring him to the United States for medical treatment for a severe lung ailment – possibly tuberculosis – and to help create a better life for everyone in the slum he came from. As a middle-class teenager in California, I had no idea that people lived anywhere in tiny shacks with dirt floors. The article mentioned that when a dog bit the leg of Flavio’s little brother, his mother grabbed a bottle of alcohol, poured it on his leg, and quickly went back to the rest of the miserable daily hardships of caring for her family. Shocking photos accompanied this article, showing Flavio’s life in the filthy slum, in which, as his parents’ oldest child, he had to earn pennies to feed them their rice and beans every day because his father had injured his back and could earn only $20 a month. But on the magazine’s cover, Flavio wore clean, new pajamas, print on a white background, that were given to him at the hospital he was taken to in America. Just as I had suddenly become aware of a world like his, he had now been introduced to a world like mine. I was completely stunned by the contrast. I wished that I could bring Flavio to the beautiful house I lived in with my family and show him all of our modern conveniences. So I pretended that he was there with me, and I walked through the rooms showing him everything I had previously taken for granted. “Look!” I said out loud. “These are called faucets. You just move the handle like this and fresh water comes out!” I went on to show him the stove, with its miraculous burners that turned on as easily as the faucets, and the big, shiny brown refrigerator, with so many kinds of delicious food in it. I imagined Flavio’s face lighting up with amazement and delight. That day, I gave birth to a new dream. I dreamed I would someday introduce someone else to an easier and happier way of life, beyond anything they had ever known. I was excited for Flavio that he had come to America, and for the first time, I dreamed of one day adopting a baby and giving it a life it wouldn’t otherwise have had. Thirty-two years later my husband and I did adopt a baby, and she is now 20 and thriving. But I also realize now that my passion for teaching comes from this same place of wanting to see others enjoy things that I am fortunate to possess already. This desire has become the strongest motivating factor in my life. I know I am extraordinarily fortunate to have received not only excellent piano training in my youth but also training in mindfulness-awareness meditation for many years from a true master teacher. And I feel even luckier that I have been able to blend these two incredible traditions, of Western music and Eastern meditation, into an approach to practice and performance that has helped many musicians discover a whole new world of possibilities. So often, a musician who has been struggling for years to play with more ease, confidence, and brilliance suddenly discovers how to do it right in front of me. When that happens, a wave of warm energy spread through my entire body. That person may not feel as desperate in their struggle for musical fulfillment as Flavio and his family were in their struggle for a decent material existence. But they may still be suffering deeply – from debilitating stage fright, from practice-related tension or injury, or from intense frustration with their ability to express themselves freely through music. They may feel disheartened about their musical future, and they may wonder if they could ever come close to the kind of playing they admire in the greatest performers, the rare few who somehow shine brighter onstage than the rest. The first time this musician works with me they may discover a simple, new physical or musical technique that works as easily as turning on a faucet and suddenly having cold or hot water run freely. Just as suddenly, their playing suddenly flows more easily than before. Their ease and confidence in practice and performance develop and deepen a lot over time, and if they continue with this new approach, they may actually begin to live in the new world of possibilities they discovered when they first tried it. When that happens, I feel enormous satisfaction – that I am fulfilling my true purpose, using all of my talents and training to help someone else become the musician they’re meant to be. Are You Ready to Discover Your New Possibilities? If you’re ready to break through to a new level of performance, I invite you to join us this July for the Art of Practicing Institute’s unique and transformative summer program. Each participant contributes so much to this astonishing program and extraordinary community of musicians, and we’d love to have you join us. Amateurs and professionals are all welcome. It’s about being fully human in making music, and finding out what that longing inside of you can really lead to. P.S. If you’re wondering if the summer program is right for you, by all means, give me a call or send me an email. I’m happy to answer your questions. We want you to feel part of everything that happens during that incredible week. I’ve heard a lot about your approach, the Art of Practicing. Would you say it’s for everybody, or only for a certain kind of musician? Anyone who’s curious about working with this approach can benefit from it. Even applying one or two ideas from it can make your practicing easier and more enjoyable. But for some musicians, the approach resonates more deeply. Generally, what motivates someone to learn more about it is some kind of dissatisfaction with their current experience of practice and performance – some physical discomfort with their instrument, a lack of confidence onstage, or a feeling of not being able to fully express themselves in making music. They feel like something is blocking their way, and they want to feel more free. But even realizing that you want more freedom comes from having already had a glimpse of it, and from feeling the contrast between that glimpse and your usual experience with music. My own sense of the possibility of more freedom and confidence at the piano came after an unsuccessful audition. It somehow didn’t make sense to me that after so much work, for so many years at the piano, I still didn’t have the kind of confidence I wanted. I had seen performers who seemed to possess a whole different kind of ease and confidence onstage. And something told me that it must be possible for me to develop that too. But I was 29 before I fully recognized this deep longing in myself, as well as the deep faith that what I desired must actually be within my grasp. For me, the road to this confidence began with mindfulness meditation, which I remembered had relaxed me when I first tried it a year earlier. This time, when I felt intense self-doubt at an important audition, I was finally ready to go back and try meditation again and to stick with it. And it ended up leading me to a feeling of being deeply at home onstage, to the kind of confidence I really wanted. The whole development of the Art of Practicing came from that experience of feeling at home in my own body and mind, in both practicing and performing. You can’t really dive into something new if you’re not ready for the change it will bring. Meditation, and the Art of Practicing as well, changes your life. And like anything else, there is a time for it – a time when your body and mind say Yes. I have a wonderful student right now who read the book several years ago and only recently reread it and found it really had a lot of meaning for her. That’s when she was ready to contact me and start lessons. So I would say, the best thing to do is to try it if you like, and to see where it takes you. Be true to yourself. That’s really what the Art of Practicing is about anyway. 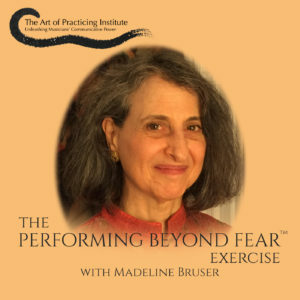 Submit a question for possible inclusion in next month’s issue of Performing Beyond Fear..